Liquid spills should be soaked up immediately. Why? Excessive water on the floors can lead to permanent stains. Don’t use wax, vinegar and any ‘all-purpose’ cleaners. They dull the floor’s finish. In order to trap sand and grit, place rugs or mats near doorways and in high traffic areas. Don’t move furniture or heavy items across your wooden floor. Carry them or use gliding furniture pads instead. Always use protective pads or caps on furniture. Make sure your pet’s claws are trimmed so they don’t scratch the floor. Don’t wear high heels on your wooden floors. They can dent it. When you finally clean your floor, you can first dust the floor with a mop that has been treated with a dusting agent. This will pick up dust, dirt, and hair that might scratch the surface. If you clean weekly or biweekly, use a vacuum with a floor-brush attachment. Do not use a vacuum with a beater bar attachment as that can scratch your floor. For a quick dusting, you can use disposable electrostatic cloths. We recommend you use both sides of the cloths to save money. If you’re going to do a deeper cleaning on your wooden floor, we recommend that you do it during the spring or the winter holidays. It doesn’t have to be done very often. However, it does need to get done. Why? Dirt, grime and other nasty tidbits build up over time and you’ll want to get rid of them. Use a wood-cleaning product like Bona, which is what we use. Dilute it according to the package instructions. Saturate a sponge or a rag mop in the water, and then wring it almost dry. It should feel only slightly damp to the touch. 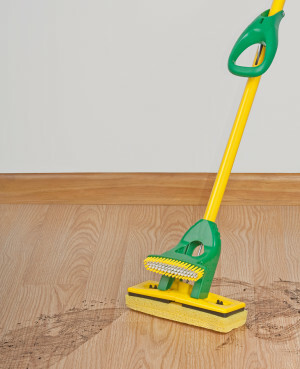 Damp-mop the wooden floor and be careful not to create any water pockets on the floor as these can cause staining. Rinse with a clean mop dampened in clear water if the cleaning product requires it. Wipe up excess fluid. If you have any more questions about cleaning a wooden floor, give us a call at Maids Around Town. We can be reached in Austin at 512-782-4578 or in Houston at 832-930-3210. We’re happy to do the cleaning for you.